This tutorial explains the specificities of the Excel TEXT function and shows some clever ways to use Text formulas in Excel. Microsoft Excel is all about numbers, and in your worksheets, you are likely to deal with numbers most of the time. However, there are situations when you need to convert numbers to text, and it is where the TEXT function steps in. In its pure essence, TEXT in Excel is used to convert a numeric value to a text string in a specific format. Value - the numeric value to be converted to text. It can be a number, date, reference to a cell containing a numeric value or another function that returns a number or date. Format_text - the format that you want to apply. It is supplied in the form of a format code enclosed in the quotation marks, e.g. "mm/dd/yy". The TEXT function is available in all versions of Excel 2016, Excel 2013, Excel 2010, Excel 2007, Excel 2003, and lower. To display numbers in a more readable way or in a format that makes more sense for your users. To display dates in a specific format. To combine numbers or dates with certain text or characters. Important note! The TEXT function in Excel converts a numeric value to a text strings. Consequently, you won't be able to use the result of your Text formula in other calculations. If there's such a need, you can keep the original values (hidden or kept out of sight), and use them in other formulas. As you have just seen, the syntax of the Excel TEXT function is very straightforward, a tricky part is supplying a proper format code that will output your number the way you want. Essentially, the TEXT function accepts most of the format codes used in Excel number formats. The table below lists the most common and frequently used ones. If you type 2.5 in the referenced cell, it will display as 2.50. # Digit placeholder that does not display extra zeros. #.## - displays up to 2 decimal places. If you type 2.5, it will display as 2.5. If you type 2.555, it will display as 2.56.
? Digit placeholder that leaves a space for insignificant zeros but doesn't display them. It is generally used to align numbers in a column at a decimal point. #.?? - displays a maximum of 2 decimal places and aligns the decimal points in a column. , (comma) Thousands separator. ###,###.## - displays a thousands separator and 2 decimal places. Additionally, you can include any of the following characters in the format code, and they will be displayed exactly as entered. The following spreadsheet shows how you can use a Text formula in Excel to apply different formatting types to the same value. When using the Excel TEXT function with dates and times, you can use any of the following format codes. AM/PM Time represented as a 12-hour clock, followed by "AM" or "PM"
So far, you might have an impression that the use of the Excel TEXT function is quite limited (because a value's display can easily be changed using the Format Cells dialog available via a cell's context menu or Ctrl+1 shortcut). The situation changes as soon as you start using TEXT in combination with other Excel functions. The below examples will give you a few inspirational ideas. When creating summary sheets or reports, you may often want not only calculate totals, percentages and the like, but also explain to your users what this or that number means. To do this, use the CONCATENATE function to join text and numbers, and the TEXT function to display the number (or date) like you want it. Supposing you calculate the total amount based on the unit price in cell A2, quantity in B2, and discount percentage in C2 using this calculation: =A2*B2*(1-C2). For your users to know exactly what the output number means, you wish to display it together with some explanatory text like "Your price is". Additionally, you want to show the currency symbol, thousands separator and two decimal places. When you return the current date using TODAY() or NOW() function, you may also want to display it in combination with some text so that no one has any doubt what day this date refers to. Excel will return a very odd result, something like "Today is 42198". The point is that in the internal Excel system, dates are stored as numbers, and that number appears in a concatenated text string. To fix this, use the TEXT function to display the date the way you want. For example, embedding the TODAY function in the Text formula with the format code "dddd d mmm, yyyy" will return a string similar to this: "Today is Monday 12 Dec, 2016". A few more formula examples can be found here: Concatenate numbers and dates in various formats. As you know, Microsoft Excel automatically removes leading zeros typed before a number in a cell, which works fine in most situations. But what if you want to keep the preceding zeros? 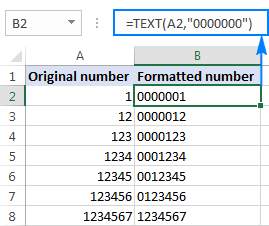 The Excel TEXT function can be an easy solution to pad numbers with leading zeros in a column, even if the original values are not the same length. Simply use the format code containing only zero placeholders like "0000000", where the number of zeros corresponds to the number of digits you want to display. As you can see in the screenshot below, our Excel Text formula adds as many leading zeros as necessary to make a 7-character long string (please remember, the result of the TEXT function in Excel is always a text string, even if it looks like a number). Turning a column of numeric values into telephone numbers may sound like a tricky task, but only until you remember that the Excel TEXT function allows using dashes and parentheses in format codes. The TEXT function returns the #NAME? error if you omit the quotation marks around the format code. The TEXT function in Excel is language-specific, and requires using region-specific date and time format codes. For example, the formula =TEXT(A2, "mm/dd/yy") that works fine for English users may return the #VALUE error in other locales. In particular, in Germany, you'd need to use the following format codes: "t" instead of "d" and "j" instead of "y" because "day" in German is "tag" and year is "jahr"; "m"(month) is fine because in German it also begins with "m" (monat). So, in German Excel, the above formula will read as follows: =TEXT(A2; "mm/tt/jj"). In France, you'd use the "mm/jj/aa" format code because "day" is "jour", "month" is "mois", and "year" is "an". Also, please pay attention that in European countries, the List Separator is usually set to semicolon, not comma, and therefore ";" should be used to separate the formula's arguments. This is how you use TEXT in Excel. If someone wants to have a closer look at the formulas discussed in this tutorial, you are welcome to download the Sample Excel TEXT function worksheet. Apart from TEXT, there are a handful of other functions to work with text values in Excel. Some of them are designed to convert text into numbers and the other way round, while others are used for manipulating text strings themselves. Below you will find formula examples of both types. 29 Responses to "Excel TEXT function with formula examples"
i am concatenating headings and associated numbers for a report. all of the numbers have a currency fomrat. i am using the followning function to show thousand separators: "£#,##0;;@"
This is because the negative numbers section is empty in your format code. To have the format apply to all number types - positive, negative and zeros - use only the first section of the format code: "£#,##0"
You can find more information in Understanding Excel number format. I would like to know how I can add text to the number format? Any idea of a work around? Does using =TEXT(TODAY(),"dd ") & "Days " & TEXT(TODAY(),"hh ") & "Hours" give you what you require? My question is,, in this formula =if(A1>B1, "Yes", "No"). I want Yes in bold, is it possible using Text function. The TEXT function can only change the way a number appears in a cell by applying a custom number format to it. It cannot apply bold, italic, or underlining style. To my best knowledge, none of the Excel functions can do that. this function is working for positive numbers only and for zero it shows (R±00) without G .
I am wanting to split dates into 'Month' A and 'Month' B where up to the 15th is A and 16th onwards is B. If the date is 15th or below it shows A correctly but otherwise on the first I get #VALUE! and on the second instead of B, it shows 60, i.e. Nov 17 60. In the formula below, the negative difference does not appear in Red. Is there a different formatting method to make the negatives red? Please note that the TEXT function does not support color formatting. So if you copy a number format code from the Format Cells dialog that includes a color, e. g. $#,##0.00_);[Red]($#,##0.00), the TEXT function will accept the format code, but it won’t display the color. I am using text formula to display other cells as a certain amount of digits with leading zeroes. all is well with that. what I am unable to figure out is how to get a blank in my result when the original cell is blank. right now, with the basic formula, it displays all zeroes in the amount of digits I've chosen, but as I'm saying, I want to return a blank cell. I've tried =if(isblank)etc with the text formula embedded if the cell is not blank (hope that makes sense) but that either doesn't work or I've gotten the syntax wrong. can anyone help me here?? thank you *SO* much for any help anyone can give me! Could someone help me with the formula that when type a code it shows the text from another cell, please? I need to make it easier when I'm requesting supplies from my stock excel file just typing the code of the product. Today is 1 Feb 2018 (01/02/2018 in dd/mm/yyyy). I want to retrieve the month portion of the current date. I can do that with MONTH(TODAY()), and it will return 2. If I try TEXT(MONTH(TODAY()),"mm"), it returns "01". I have tried using a new sheet on my Citrix computer - it returns "01". I have tried using a new sheet on my BBB Android phone it returns "01". You're getting that problem because you're converting the date to the number 2, and then you're telling it to convert the number 2 into a date, which it then knows as 02/01/1900 (dd/mm/yyyy), so then when you run the text formula, you're getting the 1 from the January. I am trying to get the formula ="+ "&SUM(I29-D29)/D29 to appear as +23% It appears as +0.231952922620801 Have tried clicking % function button, using formula pull down menu and format menu. Nothing works. Is it possible to place a text + in front of a calculated percentage in excel? Yes, I realize the plus is assumed but my boss wants it to appear in the spreadsheet. In scientific report, we often show 0.183 as .183, and -0.179 as -.179. How can I remove the leading zeor? Please help. I believe you can get the formatting you want by right clicking the cell that holds the data then Format Cells then Custom then enter .0000 in the Type field and OK. If your values have a variable number of digits after the decimal point, you may want to use the # placeholder that does not display extra zeros. For more information, please see Custom Excel number format. i want result in bold with using CONCATENATE without using VBA code. I put CONCATENATE formula in cell (B10) with four different cell value from cell (N5), (N6), (N7) & (N8). I want to make Bold for all the text shown from Cell, N5, N6, N7 & N8 in my Concatenate formula. Thanks in advance - Fragranace Of The Universe Is Gratitude"
The___________character is used in text formula. I'm trying to concatenate a number with the " (double quote) sign. So I'd like to convert the number 90 to 90"
I've tried =text(A1,"""), where the number is in A1, but no luck. Any ideas? Hi i am trying to create a string of numbers with initials at the end that is populated from a cell with an if statement. 2019 comes from cell L12, 000 is from cell M12 (i need the leading Zero to show when the number is only a double digit or single digit - i need it to have the 0 placeholders) and AA is from J4.